This popular download has helped people with all needs and levels of health, to relax and feel better within themselves. Whether you are looking for support during illness or just wanting to manage your stress levels better, Meditations for Life has something special to offer you. Three wonderful meditations take you on a journey that connects you to the natural world around you and reveals the hidden resources within you. Set to soothing, hypnotic music, the overall tone is at once uplifting and optimistic as well as grounding and reassuring. "Linda’s CD has played a huge part in my healing from cancer. Her voice is so soothing and the meditations so instantly calming. Each time I listen it transports me to that safe place that Linda calls ‘home’ deep inside my core. 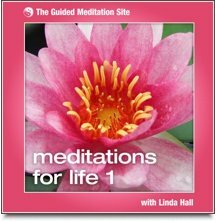 During my healing journey I have listened to many other meditation CDs but I always come back to Linda’s." "Meditations for Life 1, Relaxation and Awareness CD does just that. As my thoughts slowed down I felt safe and secure, and, with Linda’s help, I found I could release the physical tensions within me." Delcia McNeil, Author of ‘Bodywork Therapies for Women’.